Have you been to a Disney theme park and a Six Flags theme park? Which do you prefer? Which do you recommend to friends? There are some very fundamental differences between the two. Let’s take a look at those differences and how they correlate with camps. Disclaimer: I have been to Disneyland, Disney World and four different Six Flag properties, all multiple times. While there are always exceptions, this article is based on my experiences. If you have been to both a Disney theme park and a Six Flags theme park, you will notice that there is a difference in staff attitude. For the most part, Disney cast members are friendly and professional. Their uniforms are themed, quality and clean. There always seems to be a cast member close by that is knowledgable and willing to help. At Six Flags the staff, for the most part, are younger. They aren’t rude, but they aren’t necessarily friendly most of the time either. They are just indifferent. They socialize with each other much more than you’ll see at a Disney theme park. Their uniforms are…well…less professional. It’s also difficult at times to find a staff person who can answer your questions, give you directions or take a picture of you and your family. It’s obvious that Disney is more selective in their hiring process and that they do more, or better, (or both) training. There is a culture that is evident with Disney which seems to be absent with Six Flags properties. 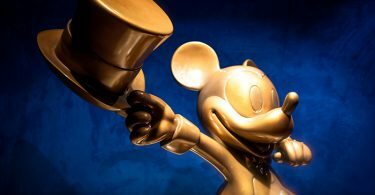 It’s as though Disney employees have a sense of pride in their work and their workplace, while Six Flags employees are there just for a paycheck. What about your camp? How good is your hiring process? How well are you training your staff? Are they there for the paycheck only, or have you instilled in your staff a sense of pride about working at your camp? How well does your staff interact with different camper ages and their parents? Does your staff fit the look of your camp? What impression do they give parents as campers are dropped off? When you look at the overall “programming” of a Disney theme park you notice that there is so much more than just rides. Disney theme parks offer shows, parades, costumed characters, themed decor, music, bands and more. Their rides (activities) are generally suited for a wide audience. In contrast, Six Flags doesn’t offer the breadth of shows that Disney offers, The production value of the shows they do offer is nothing compared to Disney’s. The costumed characters are few and far between at Six Flags, and there is rarely ever a line to take a photo with them. The themed decor is there, but it’s at such a lesser degree than Disney that you more or less miss or forget about the decor. It doesn’t really add much to the theme park experience at Six Flags. The rides (activities) are big and bold and they aren’t for everyone. Your older aunt and your young nephew will not be going on most, if any, of the rides at Six Flags. But, it’s the roller coasters that draw everyone else to those theme parks. Unfortunately, just having exhilarating rides is not enough to bring the masses to Six Flags the way Disney does. What about your camp programming? All camps have activities, but how interesting are yours? Are they for everyone? Do you offer more than activities? What about special events, shows, camp wide games that use costuming and a story, music beyond camp songs, etc.? Is there themed decor to enhance each activity? Do you just offer the typical archery taught by a bored teenager, or do you have fun targets, a progressive learning model, and a mature archery instructor who’s friendly, knowledgable and enthusiastic about teaching? See the difference? Just having big “rides” like a zipline and a lake blob are not enough to compete with camps that have a “complete” experience. One of the things I love most about Disney theme parks is how clean they are. Even if you look in the dark corners of a ride you won’t see trash, or if you do, it won’t be there for long. The overall look and feel is that of a well maintained park. Even the restrooms are clean and well maintained. Much of the facilities are themed which adds a magic to the property. They are known for repainting and polishing things that don’t look as though they need it. In fact, the dirty carnival fairgrounds that parents would take their children was the inspiration for Disneyland. Walt wanted to create a place for everyone that was clean, safe and had employees that didn’t give you the creeps. The last time I was at a Six Flags theme park (2010) the tram that took us from the parking lot to the gate had cracked seats and looked to be at least 20 years old. To be fair, however, I have heard they replaced the trams with new busses. While they look nice, they aren’t as easy to get in and out of as the trams were. The ticket booth had chipped paint, which was common throughout the park. While waiting in line for one of the rollercoasters I looked down over the railing to an area behind the ride and it was full of trash. These things were not the exception, they were the norm. Again, from what I have been told by friends, Six Flags is upping their game and the parks are now cleaner and better maintained then before. Good for them. It think they are heading in the right direction. I will admit that, back in the day, none of his really bothered me or ruined my theme park experience, because I had come to expect a certain level (or lack thereof) of cleanliness and upkeep at certain theme parks. I don’t go to Six Flags for an “overall” quality experience, I go for the rides. I really enjoy rollercoasters. Of course, I would never pay full price to go to Six Flags. Are your facilities clean and well maintained? Is paint chipping and equipment breaking? Are you spending money on the next “flavor-of-the-week” while the craft shack is falling apart? Does the camp van look like it should have been retired last century? While I’m not saying you should put money into painting all the buildings if you’re ropes course needs an inspection, I am saying that some camps may need to reevaluate the cleanliness, maintenance and aesthetics of their facilities. This is especially true if you rent space to outside groups. A friend of mine worked at one resident camp where the owners felt the “rustic look” added to the character of the property. Unfortunately, the owners confused “rustic” with “rusty”. She told me how embarrassed she was to show families around during open house. “I felt like I was constantly making excuses for why things looked like they did. The weeds, cracked cement, chipped paint, equipment not put away where it should have been, broken benches, restrooms that, while clean, looked as though they hadn’t been properly maintained. I mean, I knew they were clean, but they looked like gas station restrooms. No matter how much Lysol you use, it will never have that “hygienic” look. There was an old tractor that no longer ran, with big rust holes in it, flat tires, and a chewed up seat sitting near the front gate. Apparently, it had broken down there and they just decided to leave it. When I asked about it, the owners said that it gave the place character. An old horse carriage might do that, but this rust bucket of a tractor looked like it belonged to a farm that went bankrupt.” She didn’t stay with that camp long. A clean, well maintained facility is an important first impression for parents, rental groups, new staff, donors and the surrounding community. Parents that see how much pride goes into the facilities will conclude that just as much attention will go towards their children. Parents that see a property that is run down will assume that same lack of attention goes towards the safety of the program as well as the hiring and training of the staff. I hope that doesn’t sound like your camp. Disney theme parks are more expensive than any of the Six Flag properties. 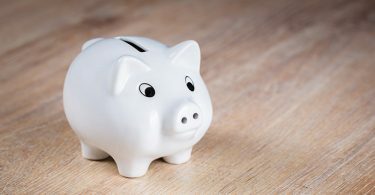 Also, they don’t offer discounts to the general public, beyond package deals and corporate or government groups (even then, the discounts are very small or only come in a multi-day package). Yet, they bring in more business than any competing theme park. Six Flags general admission tickets are already less than Disney, but, on top of that, Six Flags offers discounts constantly, from “kids price” deals to Coke cans to advanced purchase tickets on their website. There is absolutely no reason anyone should ever pay full price to go to a Six Flags theme park. There are just too many ways you can get a discount. Why does Six Flags have to entice people to visit using discounts and promotions if they are already less expensive than Disney? Does Six Flags see Disney as their competition? Or have they set their sights lower, looking at miniature golf courses, bowling alleys, roller skating rinks and other amusement operations as their competition? It’s as if they know they can’t compare to a Disney experience. What about your camp? Do you offer discounts to parents? Do you price your camp experience lower than your competition? Do you really need to use that tactic to fill your spots? I’m not opposed to offering discounts if it’s done in a smart way that does not devalue your camp experience. However, there is a difference between offering multi-week, sibling or other package discounts and offering absurdly deep early bird or Groupon discounts. One rewards loyalty and the other is a show of desperation. Agree or disagree?. What if Six Flags were to take everything that is great about Disney and add in their own magic? What if they created fun rides that appealed to all ages, had really great shows, better themed decor, put cleanliness as a top priority, maintained their facilities, created a culture their staff could be proud of, created better staff and customer service training, etc? What if they put forward an attitude of caring about giving their customers the best experience possible? Would they have to offer discounts to get people to visit? Could they charge more for general admission? What if you focused more on better hiring, better training, better supervision? What if you added a progressive program to take campers from beginner to advanced levels in various activities? What if you put some real effort into making your facilities stand out through themed decorations, proper maintenance, cleanliness and organization? What if you created a culture through traditions, camper and staff recognition, camper and staff suggestions, quality customer service and more, that employees could be proud of? What if you offered entertainment for your campers where staff acted out scenes, dance routines, magic shows, music videos, etc.? What if you had a mascot in a costume that visited on occasion? What if you had costumed characters based on a theme as part of camp? 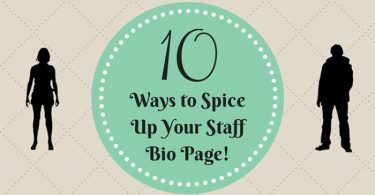 What if you created staff committees for special events, themes, activity enhancement, friendship making, camp magic infusion, special shows, improving check-in and check-out, social media, etc.? 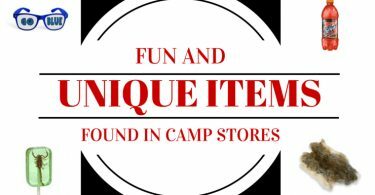 A “Six Flags type of camp” to me is one that is created and managed by a person (or organization) who loves thrills (or one aspect of camp) but doesn’t really care as much about the other areas of camp or the experience as a whole, yet knows that a camp needs to be more than just cool activities. This person doesn’t understand why the camp isn’t full so they do everything they can in the way of discounts and promotions to get people to come. They don’t see that the problem isn’t the price, it’s the issues with programming, staffing, a lack of magic and wonderment, a lack of culture and traditions, poor facilities, and more. A “Disney type of camp” to me is one that is created and managed by a person (or organization) who truly cares about the whole experience. They don’t feel the need to offer discounts because they know that the experience they offers is worth every penny and that people will be telling all their friends about their camp. They may have more or fewer activities that may be better or worse than their competitors, but that doesn’t matter, because they know that camp is much more than the activities it offers. They put a lot of stock in the staff they hire and they mentor and guide them. They recognize and reward hard work and fresh ideas. They are constantly asking for feedback from their customers and the staff. They keep their facilities in pristine condition, and they bring the magic through decorations, special events and even parent communication. So, the question has to be asked. 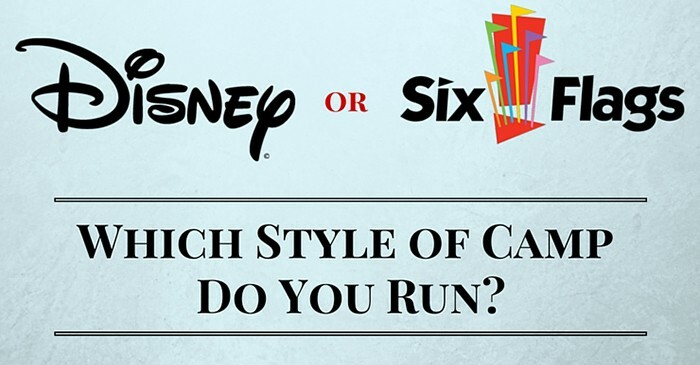 Are you running a Disney camp or a Six Flags camp? I cannot begin to tell you how “spot-on” your article is. I attended a Disney park several years ago and while visiting one of the shows, received the best camp lesson I could have ever gotten. While waiting for the show to begin, a worker came out on stage and began to set up mics and mic stands for the event. We were early so I didn’t think much about it until he began to check the mics. He started at the far end and did the usual “check-check”, moved on to the next mic, “check one two”, then the next, “Bum-ba-dum-dum”. And then someone clapped. Planned or sarcastic, I’ll never know, but the worker’s face lit up and he looked around and gave a quick little be-bop ditty into the mic, looking for a repeat applause, which grew, if only by a little bit. Another worker came out and “scolded” him, away from ear-shot but, in full view of the audience. After a brief debate, the original worker convinced the second worker to “be-bop” along with him. Before the audience knew it, there were four workers (all from various stages of this ongoing display, singing in perfect four-part harmony giving a fantastic pre-show concert. Once it was over, they took all of the mics and mic stands they “set-up” and exited the stage just in time for the show to start. Jeff, what a wonderful story and lesson. Disney does so many things right. When I get the chance to go to a theme park, especially a Disney one, I pay close attention to the operations of the park and how well (or bad) they do things. With Disney it’s all the little, almost imperceptible, things that they do that make such a big difference. Your story is a clear example of that. Thanks for sharing. This was a wonderful article, I am a director of a town run summer camp and my boss always tells our staff during training that “being at camp is like being at Disney”. So when I saw this I started laughing and printed it out for her, she also started laughing. After reading this article and breaking it down to see where our camp fell, I was happy to see that we are actually more Disney than Six Flags. But also there are things that we need to work on. One of the things that I do take pride in is how much our staff care about our campers, we have had parents come to us throughout the year and when they are registering for camp that have told us that the growth in their child since coming to camp is amazing. We had one camper that was pretty much nonverbal and very closed off come to us and for a while our counselors and staff didn’t really know how they were going to make her camp experience at camp fun and enjoyable, that is when they decided to give everyone in their group a nickname and that is how they referred to their campers the rest of camp. This little girl just blossomed, and soon she was talking and laughing with the other campers and counselors, to the point we would have to tell her she needed to stop talking and listen to instructions for activities! When she went back to school her teachers and aids told the parents that it was amazing and when they asked the parents what had changed over the summer her parents said that she had attended our camp. This made me feel so good because my counselors are young (high school and college age) and they could just be coming because they need a summer job and money but they invest all of their energy into making camp the best experience for our campers that they can. 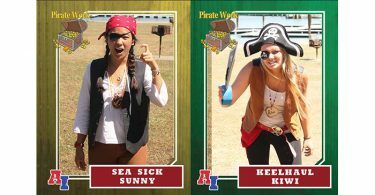 From dressing up to having food contests, to our camp music video that we do every year for the campers, our counselors are amazing. And so now I can tell our staff that leaving camp is actually like leaving Disney World! Meaghan, thanks for sharing that story. Your comment if one of my favorites ever left on my site. We often wonder if we are making a difference in kids lives. It’s usually not so evident right away. However, when that happens, when we see our positive influence changing a child’s behavior within one summer and then hear about it from parents and teachers, we feel validated in what we are doing. And that means the world to those of us who are intentional in our camp programming as well as the hiring, training and supervising of our staff. So, good for you. It sounds like you are doing wonderful things at your camp. And again, thanks for sharing.